Send me (hphubbard@gmail.com) any information you want me to add to this web page. Click here to view the services that our USPS and our Post Office offers. Use USPS rather than UPS or FedEx, if you can, to send AND receive your mail/packages. Our newest petition is set up to protest the prefunding of retiree healthcare benefits in the postal service. The post office is required by Congress to prefund 75 years of retiree healthcare benefits in a 10 year window at $5.5 billion dollars a year. They are the only business or government agency who is required to do this. All financial figures released by the postal service include this obligation by Congress in them. So the postal service financial crisis is a manufactured crisis. One manufactured by Congress. Please share and sign the petition below. 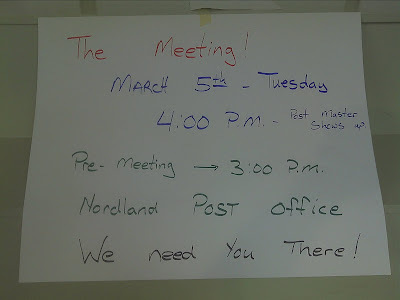 Click here to view PDN article 3/7/2013 "Marrowstone residents turn out to support post office in Nordland"
Click here to view the planning document for what is next. Click here to view the timeline for the meeting. If you will taking photos or videos at the meeting and will be uploading them to a Cloud like Picasa or Flickr, send me the link(s) and I will post them here. Click here to read Dan's (Powell's) Action Plan. Click the links below to learn about the committee and join it. 3/4 - REVISED FINAL TALLY: 26 pages of the petition = 593 signatures (including 41 proxies) less (7 duplicates and 65 off-island) equal 521 net valid. 59.4% of 877 Islanders signed the petition. 3/4 - FINAL TALLY: 26 pages of petitions = 593 signatures (including 41 proxies) less (7 duplicates and 65 off-island) equal 521 net valid. 64% of 877 Islanders signed the petition. 3/2 - 23 pages of petitions = 498 signatures less (5 duplicates and 50 off-island) equal 443 net valid. We have 25 proxies. We need 82 more signatures or 3.7 more petition pages. 3/1 - 22 pages of petitions = 476 signatures less (4 duplicates and 45 off-island) equal 427 net valid. We need 113 more signatures or 5 more petition pages. 2/27 - 21 pages of petitions = 453 signatures; net valid = 393. We need 147 (540-393) more signatures or 7 more petition pages. 2/23 - 18 pages of petitions = 396 signatures (18*22) times 95% = net valid = 376. We need 174 (540-376) more signatures or 8 more petition pages. Click here to view the Petition Committee's work page. Click here to view the Media Committee's work page. Click here to view our elected officials. Please note: The USPS and the USPS OIG handle complaints about general service-related issues. If you have a comment or complaint about a major change in service such as postage rates or the proposed Five-Day Delivery, please contact the Postal Regulatory Commission (PRC). Forward comments, questions, and complaints to the PRC using their online contact form. US Statute governing Postal Service. Click here to read an article by Senator Bernie Sanders and an explanation of why the Post Office is in financial difficulties. Click here to view the Sign Committee's work page. Click here to view the Doorbell/Telephone Committee's work page. Click here to view the Post Office's response to the FOIA (Freedom of Information Act) request. Click here to view the Legal Committee's work page. Click here to view some photos of the meeting. Per Heather Tillman ( 379-1434 heatherseawa@yahoo.com ) - Since we were told tonight that we need to "raise a stink" to get anywhere on this - rather than on a fast tract to closure - I suggest that if you can't be at the March 5th meeting, you send me a headshot photo, and with your permission I will enlarge it, put it on a stick, and carry it to the meeting to represent your personal concern! The same for any other snowbirds out there that feel strongly about this.. The more the merrier on this, and it would be a good visual reminder of the many people behind this issue who are not always visible. Click this link to view and print a copy of the Postal Plan letter and survey. There is an article in today's PDN about Post Offices closing. As you may have heard, they have said they will not be closing rural post offices as had been previously announced. (yet) However, they will be cutting the hours of many, including ours, from 8 to 6 hours daily. The article further states they will: '... seek regulatory approval and get community input, a process that could take several months'. It also quotes Megan Brennan, the Postal Service's chief operating officer as saying 'At the end of the day, we will not close rural post offices until we receive community input'. It appears we have our work cut out for us! We need to contact Representative Dicks and Senators Cantwell and Murray to tell them how important it is for us to keep this post office open!! I posted a this link to a web page with contact information for our elected officials and then I received the following request: “can someone send out a straightforward list of the email addresses of the people we need to contact? we'll get right on it if we have a list. and if there are phone numbers we will phone them too. and send faxes!!! !” If you can collect that information and send it to me, I will post it here. Click here to view the PDN article and click here to do a Google search for other related articles. Other articles will be listed below.